I, like every other average young woman, would like to live in the Dark Kingdom. Oh, okay, not every average young woman. Every well-informed, intelligent, above-average young woman. How's that? No? How about every well-informed, intelligent, above-average young person. After all, there are opportunities for every gender and every orientation there. All right? Good. 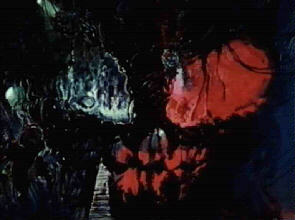 The Dark Kingdom's pretty creepy, but at the same time, it's really cool looking. It is, as one would expect, dark, and the landscape is really awesome… twisted, rocky, twined with various mutant-type plants, spiraling stalactites and stalagmites, and various bizarre formations, including the Queen's skull-shaped throne room (or whatever it is). One thing that I particularly like about it is the lighting. It is always dark, but the lighting is often weirdly supernatural, glowing reds, greens, blues or the like. It also appears to be constantly storming or otherwise dismal, and streaks of blue lightning seem to be omnipresent in Dark Kingdom scenes. I don't know, but I bet there's no need for a weatherman (weatheryouma?) in this sealed-parallel-dimension-with-an-entrance-at-the-North-Pole-that-has-lots-of-caves. For something that gains its earthen access through the arctic D-point, it doesn't seem that cold... which makes sense, being that it's kind of underground, and so would be a little warmer. Hm. Some of the formations also serve other purposes. In this picture, a grand and rather odd rock sculpture is used as a chair, and works quite effectively, in a visual sense. 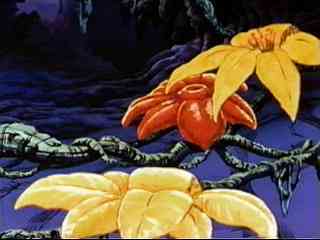 Doesn't look that comfortable, though, but I suppose that's Kunzite-sama's problem, not mine. The light sources in the Dark Kingdom are rarely seen. This is one of the exceptions. Here, there are some weird fungus-things that seem to radiate their own luminescence, but while the main light appears to come from behind, it is actually coming from above the throne, in the beautiful, rocky chandelier that glows in constantly changing, weird colors. The ground is also unusual. Whereas the walls are raw, unfinished stone, the floor has been smoothed and polished to the point that it appears of a texture similar to marble, giving the surroundings, which would otherwise appear very rough, some elegance. I wonder where this location is, by the way. Is it in their home? If it is, I'd seriously consider a decorator, and some more furniture. Look at the space! Some of the formations are outright weird. 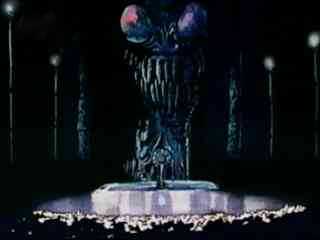 Like Beryl's demon-skull throne here. Gross. I wouldn't like to sit with that nasty thing over me, or to have a conversation with someone seated under it, though I suppose Dark Kingdom types are used to this sort of thing. After all, they live there, and presumably have for a very long time. Who would carve such an ugly thing? In my opinion, it's a manifestation in the "natural" surroundings of Metallia's evil -- and so that's where Beryl as her chief slave would sit. The Dark Kingdom wouldn't be easy to get used to living in, would it? Freak city. However, obviously, some do. And some wish they could. That's me. But anyway. 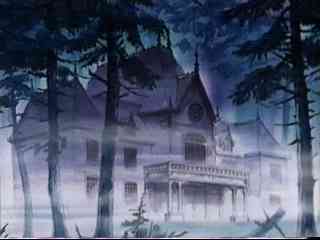 This is Nephrite's house. Mansion. Cathedral. Whatever. He lives there. It's not part of the Dark Kingdom per se, nor is it part of the earth realm. 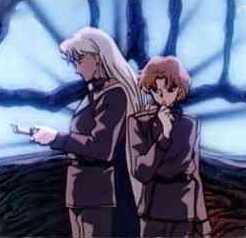 It's my assumption that it existed in the Kingdom before he became head youma commander after Jadeite's… er… icing… and then was moved in order to give Nephrite a closer proximity to the land and, of course, to the stars that guide his power. I don't think there are any stars in the "real" Dark Kingdom. I don't think he could really see any stars from the constantly foggy mansion yard, but fortunately the astral scenes didn't seem to mind appearing in the main room of the place. Maybe they like the stained-glass rose (that's an art term, not a flower) window, especially with the other large square, colored windows in the room. I do. I bet the rest of the house is lovely as well -- it certainly has a gorgeous balcony that overlooks the elegant (if dismal) evergreen forest. Nephrite's residence is different, in the fact that it has architecture of a human building and is located on earth, but he is most definitely from the Dark Kingdom. 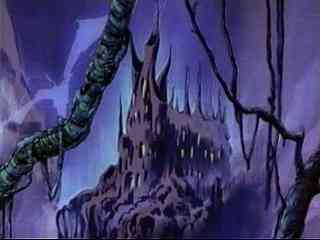 More standard as to what one would expect from a dwelling of a Dark Kingdom denizen (or two) would be the castle that is generally thought to be Kunzite's and Zoisite's home. This castle is not by any human architect, that's for sure. The spires and many oddly-shaped windows give it the appearance of perhaps a natural (if anything in the Dark Kingdom is natural) formation of stalagmites. I think perhaps it may be another manifestation in the land of Metallia's power, making it not natural, but not consciously designed, either. Whatever it is, two kings live there, though the interior is barely seen, save the window, which also appears to be roughly separated like a naturally formed stained-glass window. The walls look like many walls in the Kingdom -- black, with blue, reddish, and violet highlights that streak through, making the walls looks psychedelic, or at the very least, tie-dyed. Zoisite is well-known to have a fondness for flowers (except red roses, which are abhorred by all of the kings), and this affection is one that Kunzite appreciates. There are some very interesting types of flora growing outside their castle, and so I think it's a garden of the only blossoms that will grow in the barren kingdom. Whatever they are, wildflowers or cultivated, they're pretty. Freakish, but pretty. 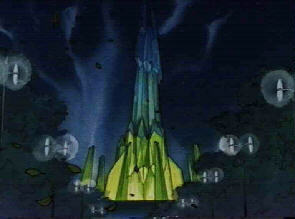 They're the Dark Kingdom version of Nephrite's evergreen forest. It appears that they are growing on some sort of vine, and seem like they would have a texture unlike most earthen flowers -- thick, smooth but sturdy, and, in the case of the red/orange one, maybe a little squishy. Kind of gross, but if they're all that will grow, that's what will be there. They do add some color to the otherwise all ebony, navy, and aubergine Kingdom landscape. I believe that it is in this garden that they sit in episode #23, when Zoi's being wimpy about Nephrite's threat that he'll get the ginzuishou first. Some similar flowers are seen in that shot. Kunzite and Zoisite, I think, have a nice house, well-suited for kings. Jadeite, poor, sadly undeveloped but oh-so-cute Jadeite, is not seen with a definite home. Where he lives is unknown, but I'd assume it's in the Dark Kingdom, though he could have relocated to Earth like Nephrite. This is the Starlight Tower. 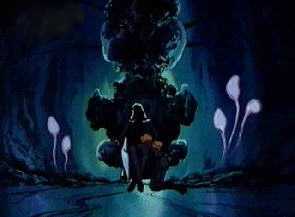 It was the location chosen by Zoisite for his ill-fated final duel with Tuxedo Kamen for the nijizuishou, and during the course of the episode, is transported or transformed or something by Kunzite, becoming definitely influenced by and possibly connected into the Dark Kingdom for a brief period of time. This was somewhat hacked up in the dub; it looks like Kunzite's cape and hair blow, the city goes dark, and then it goes to freaksville. 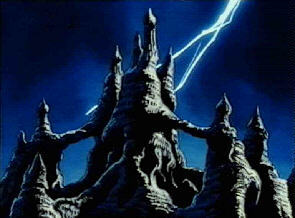 In the original, the building's transformation is shown in clearer detail, as evil weird things swirl around the spire and it becomes Dark Kingdom-ish, complete with ugly rocks and vines, though I think that in its original form, it was pretty darn unusual in itself. I'm going to take a break from enshrining here, as I'm having difficulty integrating all the pictures I want to, so here goes a brief montage of Dark Kingdom scenery, complete with some very nice kings. 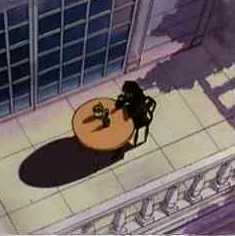 This is Nephrite's balcony, where we can see him having some lovely lem- er, refreshments. (forgive the dub joke, but come on! I'm only human.) Note the large, window-paneled doors, the lovely architecture, the shadows cast by the forest, and the facts that though he is from the Dark Kingdom, he actually utilized cement, and that he is currently attempting to get drunk. 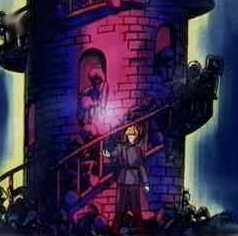 This is Jadeite, standing in front of an odd tower that I relate to the Dark Kingdom, as it's a bit too weird to be a real part of the amusement park featured in the episode. Funny thing is, most of the time, when he does this motion, he's in an all-black room. Huh. Maybe he imagines himself a Prince Charming. Or a King Charming, as the case may be. This is the window in Kunzite's and Zoisite's castle. Note the design, as well as the fact that it is being lit up by a lightning storm. Also note that Kunzite's feigning interest in the nijizuishou and actually being camera-shy, while Zoisite is biting his nails. Or maybe just biting his thumb at us. Bad boy. All right, that's enough. I'd like to stick some more pictures in, but I can't find the ones I'm looking for (unfortunately, the Dark Kingdom is anything but photogenic, you see...), so I'll conclude this shrine by saying that the Dark Kingdom is a very cool, very creepy place, especially for one that appears on the outside to be just a bunch of rocks and blackness. And I'd still like to live there. I bet there are plenty of very interesting people there to meet, and it's sure different than anyplace on earth. Except maybe Hollywood. That's freaky, too. Expecting a silly saying here? Sorry, hon, but buildings and places don't talk.